A group A streptococcal infection is an infection with group A streptococcus (GAS). 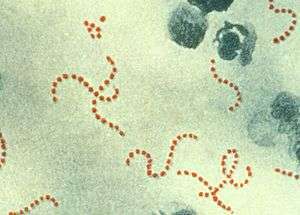 Streptococcus pyogenes comprises the vast majority of the Lancefield group A streptococci, and is often used as a synonym for GAS. However, S. dysgalactiae can also be group A. S. pyogenes is a beta-hemolytic species of Gram positive bacteria that is responsible for a wide range of both invasive and noninvasive infections. Infection of GAS may spread through direct contact with mucus or sores on the skin. GAS infections can cause >500,000 deaths per year. Despite the emergence of antibiotics as a treatment for group A β-hemolytic streptococcus, infection of GAS is an increasing problem, particularly on the continent of Africa. There are many other types of streptococci (species of Streptococcus), including group B streptococcus (Streptococcus agalactiae) and Streptococcus pneumoniae, which cause other types of infections and should not be confused with group A strep. Several virulence factors contribute to the pathogenesis of GAS, such as M protein, hemolysins, and extracellular enzymes. Group A β-hemolytic streptococcus can cause infections of the throat and skin. These may vary from very mild conditions to severe, life-threatening diseases. Although it is not completely clear what causes different people to develop different diseases as a result of infection with the same pathogenic bacteria, it is suspected that host phenotypic and epigenetic factors are the source of such variation. Indeed, the many virulence factors of GAS can influence the epigenetics of the host. Furthermore, persons with suppressed or compromised immune systems may be more susceptible to certain diseases caused by GAS than other persons with intact immune systems. Humans may also carry the GAS either on the skin or in the throat and show no symptoms. These carriers are less contagious than symptomatic carriers of the bacteria. The non-invasive infections caused by GAS tend to be less severe and more common. They occur when the bacteria colonizes the throat area, where it recognizes epithelial cells. The two most prominent infections of GAS are both non-invasive: strep throat (pharyngitis) where it causes 15- 30% of the childhood cases and 10% of adult cases, and impetigo. These may be effectively treated with antibiotics. Scarlet fever is also a non-invasive infection caused by GAS, although much less common. The invasive infections caused by Group A β-hemolytic streptococcus tend to be more severe and less common. This occurs when the bacterium is able to infect areas where bacteria are not usually found, such as blood and organs. The diseases that may be caused as a result of this include streptococcal toxic shock syndrome (STSS), necrotizing fasciitis (NF), pneumonia, and bacteremia. In addition, infection of GAS may lead to further complications and health conditions, namely acute rheumatic fever and poststreptococcal glomerulonephritis. Bacteremia can be associated with these infections, but is not typical. Some strains of group A streptococci (GAS) cause severe infection. Severe infections are usually invasive, meaning that the bacteria has entered parts of the body where bacteria are not usually found, such as the blood, lungs, deep muscle or fat tissue. Those at greatest risk include children with chickenpox; persons with suppressed immune systems; burn victims; elderly persons with cellulitis, diabetes, vascular disease, or cancer; and persons taking steroid treatments or chemotherapy. Intravenous drug users also are at high risk. GAS is an important cause of puerperal fever worldwide, causing serious infection and, if not promptly diagnosed and treated, death in newly delivered mothers. Severe GAS disease may also occur in healthy persons with no known risk factors. All severe GAS infections may lead to shock, multisystem organ failure, and death. Early recognition and treatment are critical. Diagnostic tests include blood counts and urinalysis as well as cultures of blood or fluid from a wound site. Severe Group A streptococcal infections often occur sporadically but can be spread by person-to-person contact. Close contacts of people affected by severe Group A streptococcal infections, defined as those having had prolonged household contact in the week before the onset of illness, may be at increased risk of infection. This increased risk may be due to a combination of shared genetic susceptibility within the family, close contact with carriers, and the virulence of the Group A streptococcal strain that is involved. Public Health policies internationally reflect differing views of how the close contacts of people affected by severe Group A streptococcal infections should be treated. Health Canada  and the US CDC recommend close contacts see their doctor for full evaluation and may require antibiotics; current UK Health Protection Agency guidance is that, for a number of reasons, close contacts should not receive antibiotics unless they are symptomatic but that they should receive information and advice to seek immediate medical attention if they develop symptoms. However, guidance is clearer in the case of mother-baby pairs: both mother and baby should be treated if either develops an invasive GAS infection within the first 28 days following birth (though some evidence suggests that this guidance is not routinely followed in the UK). Diagnosis is by a swab of the affected area for laboratory testing. A Gram stain is performed to show Gram-positive cocci in chains. Then, the organism is cultured on blood agar with an added bacitracin antibiotic disk to show beta-hemolytic colonies and sensitivity (zone of inhibition around the disk) for the antibiotic. Culture on agar not containing blood, and then performing the catalase test should show a negative reaction for all streptococci. S. pyogenes is CAMP and hippurate tests negative. Serological identification of the organism involves testing for the presence of group-A-specific polysaccharide in the bacterium's cell wall using the Phadebact test. The rapid pyrrolidonyl arylamidase (PYR) test is used for the presumptive identification of group A beta-hemolytic streptococci. GBS gives a negative finding on this test. S. pyogenes infections are best prevented through effective hand hygiene. No vaccines are currently available to protect against S. pyogenes infection, although research has been conducted into the development of one. Difficulties in developing a vaccine include the wide variety of strains of S. pyogenes present in the environment and the large amount of time and number of people that will be needed for appropriate trials for safety and efficacy of the vaccine. The treatment of choice is penicillin, and the duration of treatment is around 10 days. Antibiotic therapy (using injected penicillin) has been shown to reduce the risk of acute rheumatic fever. In individuals with a penicillin allergy, erythromycin, other macrolides, and cephalosporins have been shown to be effective treatments. Treatment with ampicillin/sulbactam, amoxicillin/clavulanic acid, or clindamycin is appropriate if deep oropharyngeal abscesses are present, in conjunction with aspiration or drainage. In cases of streptococcal toxic shock syndrome, treatment consists of penicillin and clindamycin, given with intravenous immunoglobulin. For toxic shock syndrome and necrotizing fasciitis, high-dose penicillin and clindamycin are used. Additionally, for necrotizing fasciitis, surgery is often needed to remove damaged tissue and stop the spread of the infection. No instance of penicillin resistance has been reported to date, although since 1985, many reports of penicillin tolerance have been made. The reason for the failure of penicillin to treat S. pyogenes is most commonly patient noncompliance, but in cases where patients have been compliant with their antibiotic regimen, and treatment failure still occurs, another course of antibiotic treatment with cephalosporins is common. Acute rheumatic fever (ARF) is a complication of respiratory infections caused by GAS. The M-protein generates antibodies that cross-react with autoantigens on interstitial connective tissue, in particular of the endocardium and synovium, that can lead to significant clinical illness. Although common in developing countries, ARF is rare in the United States, possibly secondary to improved antibiotic treatment, with small isolated outbreaks reported only occasionally. It is most common among children between 5 and 15 years old and occurs 1–3 weeks after an untreated GAS pharyngitis. ARF is often clinically diagnosed based on Jones Criteria, which include: pancarditis, migratory polyarthritis of large joints, subcutaneous nodules, erythema marginatum, and sydenham chorea (involuntary, purposeless movement). The most common clinical finding is a migratory arthritis involving multiple joints. Other indicators of GAS infection such as a DNAase or ASO serology test must confirm the GAS infection. Other minor Jones Criteria are fever, elevated ESR and arthralgia. One of the most serious complications is pancarditis, or inflammation of all three heart tissues. A fibrinous pericarditis can develop with a classic friction rub that can be auscultated. This will give increasing pain upon reclining. Further endocarditis can develop with aseptic vegetations along the valve closure lines, in particular the mitral valve. Chronic rheumatic heart disease mostly affects the mitral valve, which can become thickened with calcification of the leaflets, often causing fusion of the commissures and chordae tendineae. Other findings of ARF include erythema marginatum (usually over the spine or other bony areas) and a red expanding rash on the trunk and extremities that recurs over weeks to months. Because of the different ways ARF presents itself, the disease may be difficult to diagnose. A neurological disorder, Sydenham chorea, can occur months after an initial attack, causing jerky involuntary movements, muscle weakness, slurred speech, and personality changes. Initial episodes of ARF as well as recurrences can be prevented by treatment with appropriate antibiotics. It is important to distinguish ARF from rheumatic heart disease. ARF is an acute inflammatory reaction with pathognomonic Aschoff bodies histologically and RHD is a non-inflammatory sequela of ARF. Post-streptococcal glomerulonephritis (PSGN) is an uncommon complication of either a strep throat or a streptococcal skin infection. It is classified as a type III hypersensitivity reaction. Symptoms of PSGN develop within 10 days following a strep throat or 3 weeks following a GAS skin infection. PSGN involves inflammation of the kidney. Symptoms include pale skin, lethargy, loss of appetite, headache, and dull back pain. Clinical findings may include dark-colored urine, swelling of different parts of the body (edema), and high blood pressure. Treatment of PSGN consists of supportive care. A subset of children with acute, rapid-onset of tic disorders and obsessive compulsive disorder (OCD) are hypothesized to be due to an autoimmune response to group A beta-hemolytic streptococcal infection (PANDAS). ↑ Tanaka D, Isobe J, Watahiki M, Nagai Y, Katsukawa C, Kawahara R, Endoh M, Okuno R, Kumagai N, Matsumoto M, Morikawa Y, Ikebe T, Watanabe H (2008). "Genetic features of clinical isolates of Streptococcus dysgalactiae subsp. equisimilis possessing Lancefield's group A antigen". J. Clin. Microbiol. 46: 1526–9. doi:10.1128/JCM.02188-07. PMC 2292899 . PMID 18305132. 1 2 "Group A Streptococcal (GAS) Disease". Centers for Disease Control and Prevention. Retrieved November 21, 2012. 1 2 3 Cohen-Poradosu, Ronit; Dennis L. Kasper (2007). "Group A Streptococcus Epidemiology and Vaccine Implications". Clinical Infectious Diseases. 45 (7): 863–5. doi:10.1086/521263. PMID 17806050. ↑ Carapetis, Jonathan R.; Andrew C Steer; E Kim Mulholland; Martin Weber (2005). "The global burden of group A streptococcal diseases". The Lancet: Infectious Diseases 5: 685–694. 1 2 3 "Streptococcal Infections (Invasive Group A Srtep)". New York City Department of Health a. Retrieved 21 November 2012. ↑ "Streptococcal Infections: What is Group A Strepotococcus (GAS)". Retrieved 21 November 2012. ↑ "Streptococcal Infections (Invasive Group A Strep)". New York City Department of Health and Mental Hygiene. Retrieved November 21, 2012. ↑ Jim Dwyer (July 11, 2012). "An Infection, Unnoticed, Turns Unstoppable". The New York Times. Retrieved July 12, 2012. ↑ Jim Dwyer (July 18, 2012). "After Boy's Death, Hospital Alters Discharging Procedures". The New York Times. Retrieved July 19, 2012. ↑ Gamba MA, Martinelli M, Schaad HJ, Streuli RA, DiPersio J, Matter L, et al. (1997). "Familial transmission of a serious disease producing group A streptococcus clone:case reports and review". Clin Infect Dis. 24 (6): 1118–21. doi:10.1086/513636. 1 2 3 Health Protection Agency, Group A Streptococcus Working Group (2004). "Interim UK guidelines for management of close community contacts of invasive group A streptococcal disease" (PDF). Commun Dis Public Health. 7 (4): 354–61. ↑ Howard, SJ; Stoker, K; Foster, K (16 June 2015). "Public health management of group A streptococcal infection in mother-baby pairs in England; a case series review". Antimicrobial Resistance and Infection Control. 4: P107. doi:10.1186/2047-2994-4-S1-P107. Retrieved 7 May 2016. ↑ Kellogg JA, Bankert DA, Elder CJ, Gibbs JL, Smith MC (September 2001). "Identification of Streptococcus pneumoniae revisited". J. Clin. Microbiol. 39 (9): 3373–5. doi:10.1128/jcm.39.9.3373-3375.2001. PMC 88350 . PMID 11526182. ↑ Burdash NM, West ME (March 1982). "Identification of Streptococcus pneumoniae by the Phadebact coagglutination test". J. Clin. Microbiol. 15 (3): 391–4. PMC 272105 . PMID 7076811. ↑ "Pyrrolidonyl Arylamidase (PYR) Test: Principle, procedure and results - microbeonline". 12 November 2013. 1 2 "Group A Strep". CDC.gov. CDC. Retrieved 7 December 2014. ↑ "Group A Strep". CDC.gov. CDC. Retrieved 7 December 2014. 1 2 Good MF, Batzloff MR, Pandey M (November 2013). "Strategies in the development of vaccines to prevent infections with group A streptococcus". Human vaccine & immunotherapeutics. 9 (11): 2393–7. doi:10.4161/hv.25506. PMC 3981849 . PMID 23863455. ↑ "Initiative for Vaccine Research (IVR) – Group A Streptococcus". World Health Organization. Retrieved 15 June 2012. ↑ Falagas ME, Vouloumanou EK, Matthaiou DK, Kapaskelis AM, Karageorgopoulos DE (2008). "Effectiveness and safety of short-course vs long-course antibiotic therapy for group a beta hemolytic streptococcal tonsillopharyngitis: a meta-analysis of randomized trials". Mayo Clin Proc. 83 (8): 880–9. doi:10.4065/83.8.880. PMID 18674472. ↑ HOUSER HB, WANNAMAKER LW, RAMMELKAMP CH, DENNY FW, BRINK WR, HAHN EO, DINGLE JH (1950). "Prophylaxis of acute rheumatic fever by treatment of the preceding streptococcal infection with various amounts of penicillin". J Lab Clin Med. 36 (5): 839. PMID 14784714. 1 2 Khan, Zartash. "Group A Streptococcal Infections Treatment & Management". Medscape. Retrieved 7 December 2014. ↑ Kim KS, Kaplan EL (1985). "Association of penicillin tolerance with failure to eradicate group A streptococci from patients with pharyngitis". J Pediatr. 107 (5): 681–4. doi:10.1016/S0022-3476(85)80392-9. PMID 3903089. Note: Elements of the original text of this article are taken from the NIH Fact Sheet "Group A Streptococcal Infections", dated March 1999. As a work of the U.S. Federal Government without any other copyright notice, this is assumed to be a public domain resource.